Australia does not yet have any nuclear power plants. The intention is to sell storage space to those countries that do but have no, or poor facilities, to store their own waste. Currently the SA Government is seeking community input and response to the report to help gauge the acceptance levels of such a facility within the state, and to understand community concerns of those who may be against the idea. You can add your input through the YourSay Nuclear Community Conversation Website. My personal feelings about nuclear energy is that it is the 'snake oil' of the clean energy business. Proponents will tell you that unlike other industries the nuclear energy industry manages 100% of its waste product responsibly, therefore making it the cleanest most environmentally friendly process out there short of renewable energy sources such as solar, wind and hydro electricity. They're not entirely wrong. The nuclear process is far cleaner than any fossil fuel power station and you certainly get plenty of bang (pun intended) for your buck. Where it falls down, for me, is that the waste product (spent fuel rods) need to be stored safely away for generations and generations, to be managed by communities that almost literally will inherit this useless nuclear waste from their predecessors. That's why I consider nuclear energy to be snake oil. It looks great but the more this industry expands, the more waste we get and the more we have to build facilities to store it. Right now it's great, we can manage it, sure. A hundred years from now, how much of this useless nuclear waste will have been stockpiled and how long can a facility continue to run safely once its capacity has been reached? (And I haven't even mentioned the fact that uranium is a finite resource and the impacts to the environment mining for it). Any other industry would be laughed out of the room as being non viable with such a toxic waste product but somehow nuclear energy has gained a foot hold. Presently there is somewhere in the vicinity of 440 Nuclear Power Plants world wide with that number forecast to reach 500 by 2020. I don't doubt that nuclear energy can be safe. Technology is improving all the time. As far as I'm aware there are only three cases of reactor meltdowns with only two of those being major causes of environmental concern (Fukushima and Chernobyl) . Some would argue that's a pretty good record but it is a young industry, and one in which, ideally, a clean slate on meltdowns is, arguably, the only acceptable level of failure. My issue is with the waste. So much waste that has to be stored and maintained for unacceptably long times. So long that the waste could in fact outlive the human race if we continue to support environmentally irresponsible energy sources in favour of short term economic and financial gains. Make no mistake stockpiling nuclear waste is equally as environmentally irresponsible as continuing to rely on fossil fuels as an energy source. The nuclear industry is developing techniques to reprocess spent fuel to extract materials that can be reused as nuclear fuel. Something which is very encouraging but not standard practice across the industry (as near as I can tell - though things seem to be moving in that direction). I would be more on board with an SA nuclear waste dump if it came with a nuclear waste reprocessing facility. At least then we've got a waste product that has some value once we reprocess it. However, as I understand it, even reprocessing spent fuel does not result in zero waste. It just reduces the amount of waste that needs to be stored each year. Which is a better result than not reprocessing but still not better over the long term. What I don't want to see is the Nuclear industry gain such a big foothold in the energy space that it impedes the development and implementation of renewable energy sources, as well as research into up and coming, and far better alternative energy solutions. 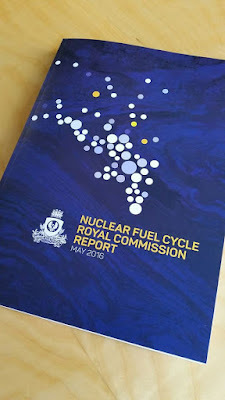 Australia has been progressing in this direction with commitments to renewable energy sources, however, once we build a facility that can store spent nuclear energy fuel, how long before our government decides to change direction and back nuclear power stations? Why wouldn't they if we already have a purpose built facility to store spent fuel? Anyhow, if you have an opinion either way on the issue and you're an Australian resident (especially if you're an SA resident) be sure to leave your thoughts on the YourSay site ASAP. I did and ended up in an interesting discussion with Christopher Nugent, another commenter who seems to be a supporter of the SA government's proposal. Christopher raised many interesting points in response to my initial thoughts so I thought I'd copy the entire conversation in full below. I'm sure I could have kept going but towards the end it started to feel a bit like we were both just trying to have the last word. I accept that Australia needs to manage its own nuclear waste. What I object to is the proposed plan to also be a commercial storage facility for the waste of other countries. Yes there are economic benefits that are massive, extremely attractive and probably highly beneficial but at the end of the day you’re still stockpiling nuclear waste that takes hundreds of years to break down and be safe. What happens when we reach capacity? Do we keep expanding? We're essentially storing a worthless product that we can't get rid of and will be a burden for future governments and communities for generations. Nuclear waste is a cancer that all countries should be discouraged from producing in the first place. The economic benefits only look good to people who aren't thinking beyond their own life time. We gladly profit from exporting the Uranium to dozens of countries. Don't we have some sort of responsibility to help store the waste? Especially since the conditions to do so here are a lot safer than elsewhere? I mean I'd rather it was here than a place like India or China. And by the way far, far, far more people have been made sick, injured or killed per generated kWhr from all types of fossil fuels than nuclear power. Go ahead and look that one up. Talk about a cancer. No. No we don't. Not at all. We export something that other countries want. How they use it and store the waste is entirely upon them. If they didn't want it, there would be no market and we would not export it. We are not responsible for what people use our Uranium for. That said, we can choose who we sell to based on what the intended purpose is... supposedly we don't sell to countries wishing to produce nuclear weapons. You'd rather countries like India or China store their waste here yet you're happy for them to build facilities that create that waste in the first place... and then they've got to ship it to us? Power Plants pose far more risk than storage facilities. In a perfect world we wouldn't have either. Maybe you haven't noticed but governments are looking for alternatives to fossil fuels, hence the nuclear power issue, which is a cleaner process if you completely ignore the fact that the waste needs to be stored for generations. Also if you ignore the fact that a reactor melt down is way more dangerous than any failure at a fossil fuel facility. Making the comparisons between deaths from fossil fuels and nuclear is a non argument anyway. We know both are bad for the environment and aren't sustainable or safe long term. There are better technologies that we could be throwing money behind to create an industry with similar economic benefits for the country. Lazy Governments with no vision are more dangerous to us in the short term. Putting aside your dismissal of our responsibility for the product we export...which personally i find tremendously selfish....much of the waste in question is actually from nuclear medicine. Which being a first world country we certainly do use just as much as other countries. We're very much a part of the nuclear waste problem, and as many have pointed out by virtue of the nature of our state's geography we're probably in the best position to do something about it. And someone certainly has to do something about. But you people are apparently all too selfish to even consider that. If you sell a product, your responsibility is to deliver the product to the quality and standard that the customer expects for their purpose. What they do with it after that is wholly on them. So long as the product delivered isn't defective we are no more responsible for it than that. If we were serious about managing waste we could elect not to sell our Uranium to countries that do not have facilities to store it to a safe standard that will last for generations - like we supposedly don't sell to countries that would use our uranium to make nuclear weapons. Australia needs a nuclear waste storage facility to manage it's own waste product which is largely from medical and university sources and not even close to the volumes created by countries that have embraced Nuclear energy. By creating a commercial storage facility here we're encouraging the proliferation of nuclear energy. Making it cheaper and easier to install such facilities without having to consider the cost of storing the waste locally. I maintain the view that any country, that wants to make use of nuclear technology, for any purpose, needs to be responsible for the entirety of that decision, including handling their own waste management locally. Presently Australia has not embraced Nuclear Energy but is under more and more pressure to do so. By building a commercial storage facility here we open up the country to the nuclear energy industry. i.e. We already have a world class waste storage facility here so it makes sense to use it to service nuclear energy plants within Australia. No thanks. It's bad enough we've sold out to this industry by exporting uranium in the first place. All of this is just chipping away at giving nuclear energy a foot hold in our doorway and will inevitably reduce the possibility of finding safer alternatives to both fossil and nuclear energy. The government is looking for short term gains and is too selfish to consider the legacy we're creating for generations that haven't been born yet and get no say in whether they want to manage a waste product that currently has no resale value. Alongside that, what happens when poorer nations get on this band wagon of storing waste to boost their economies? Do you think they won't offer a cheaper rate and possibly less than acceptable facilities? ...note that this report does look at and is considering the feasibility of a commercial storage facility for nuclear waste produced by nuclear power plants. We're not just talking low and intermediate level waste from hospitals and universities. I understand your hesitation. But the fact is the waste is something which already does exist, like it or not. Moreso than anyone else we have the capability to dispose of it safely and I still think we at least share the responsibility to do so as much as anyone else does. Our share of the responsibility is to manage our own nuclear waste that we produce. I have no problem with that. I'm just opposed to this country becoming a dumping ground for the nuclear waste of other countries in the region. But other countries do not have the geography to take care of their own waste. Whereas we have the geography to take care of much more waste. And we can do so safely for a fee. Then they don't have the geography to produce that waste either. It's only to everyone's benefit if everyone is on board with the Nuclear Energy industry. Many people and communities are not. In my opinion it's an industry that needs to be phased out rather than encouraged. There are better, upcoming technologies we should be supporting that could potentially make Nuclear and Fossil fuel energy obsolete. Sure maybe some of it could be phased out. In the mean time this waste already exists, and we continue to export Uranium, and use nuclear medicine. The waste ALREADY exists. So that is a problem that needs to be solved regardless of future policies. We have the means, and the proposed facility is it. You can whistle dixie about what you think nuclear policy should be in the future, but that is not the issue at hand. It is the issue of what to do with the existing waste. Have you read the report? This proposal is not only about storing existing waste. I completely agree with you on that point. What's more, Australia's present nuclear obligation is to manage it's own waste responsibly (which is the same obligation for any country using nuclear technology). As such a nuclear waste facility will likely be built no matter what. However storing low and intermediate level wastes (like that which Australia produces) is a different proposition and facility to the commercial storage of high level, spent fuel rods from nuclear power plants. The issue is not just the existing waste but also waste that is yet to be produced, not just by us but also by other countries who, supposedly, don't have the ability to store it safely. If it was just about the existing waste problem the economic benefits wouldn't be worth talking about. We will have to agree to disagree. I think you're looking toward the economic benefits over the actual ramifications of a stockpile of nuclear waste that'll still be glowing at dangerous levels hundreds of years from now. That's not a sustainable industry no matter how much they try to tell you otherwise. You and I have very different ideas of what's safe for the whole world when it comes to this issue. Your solution enables the expansion of the nuclear energy industry and the creation of even more waste. Something which is going to happen anyway regardless of what myself, this state, or even this whole country might decide. And again, also something which has largely already happened. And also please bear in mind the continued global use of nuclear medicine which of course I (and probably even you I would think) do support.